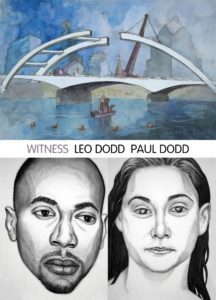 Witness features works by Paul Dodd and the late Leo Dodd, contrasting their shared impulse to document and record differing aspects of Rochester, NY. In addition to the provided reading materials related to the visual culture of crime, numerous personal and family documents also accompany the exhibition. Letters, articles and sketchbooks point to the artists’ similar working methods, their significant visual appetite, the lasting impact of a family member’s time in jail, and above all, their commitment to bearing witness.